Our Mitaboni Home cares for 60 boys and girls, ranging in age from 5 to 18. The majority of the children are orphans and came from the very poorest living conditions. For some, receiving one meal a day wasn’t even likely, and Kids Alive has made it possible for them not just to survive, but thrive. While caring for their physical needs is crucial, the staff is committed to the spiritual growth of the children. It is a joy to see the older ones begin to lead worship or help with the younger children in Sunday school classes. The Mitaboni staff is grateful to see these kids growing and serving God and others. Reaching out to help other needy children in the surrounding communities is important to our work. And as in our other Kenyan homes, Mitaboni is developing farming projects that provide food for the children in the home as well as income potential that helps provide for other needs. Demand for the greenhouse tomato production has been substantial, and we are also growing maize, pumpkins, potatoes, coffee, and bananas. At Mitaboni, Kids Alive continues the mission to care for each child’s needs, and reach them with the good news about the love of Jesus. The love among the children here is evident and contagious, showing how Jesus brings healing and transforms lives. 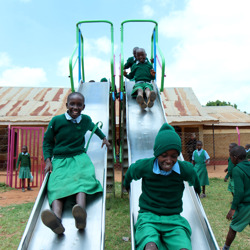 Support the Ministry of Mitaboni Children's Home with Your Gift Today.